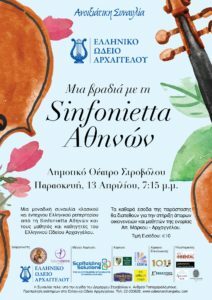 A unique concert of classical and artistic Greek repertoire by Sinfonietta of Athens along with students and professors of the Greek Conservatoire Archangel and the Future Dance Center! Pre-sale of tickets at the Archangelos Greek Conservatory. The net proceeds from the show’s tickets will be allocated to the charity work of the Spiritual Group Apostolos Markos, specifically for the support of poor families and students of the Apostle Markos-Archangelos.